The New Day and Dean Ambrose successfully defended their respective titles on a live Smackdown show. Ambrose took a nasty bump on his head but appears to be fine. There’s a full Christmas setup on the stage. Big E said they deserved the Slammy for best tag-team more than any team in history. Xavier Woods said they would send the Lucha Booties home with coal in their stockings. Kofi Kingston said they have a Christmas album to promote and they rhymed off some awful song titles to no reaction. They wished everyone a Booty Christmas and Happy New Day. Kalisto came out with a his Slammy award and they replayed the highlight from TLC. New Day got the heat on Sin Cara after Woods distracted him with the trombone. Kalisto made the hot tag but spilled to the outside after Woods pulled down the middle rope, and Big E followed by slamming him into the barricade. Eventually, Kalisto rolled out of a belly-to-belly suplex and tagged in Sin Cara. The Dragons each hit suicide dives but Sin Cara totally missed and Kingston had to sell it anyway. Kalisto hit Big E with Salida Del Sol but Woods distracted Sin Cara, who kicked Woods off the apron. Sin Cara tried a springboard moonsault but Big E caught him and hit the Big Ending for the win. Not much of a match. Dolph Ziggler, Charlotte, Tyler Breeze and Roman Reigns wished everyone a Merry Christmas in separate pre-taped skits. Ziggler and Reigns were completely sincere. Breeze called everyone uggos. Charlotte was disappointed she didn’t get a Range Rover for Christmas. Backstage, Dean Ambrose told Renee Young he has six staples in his head, and his jaw is still clicking after Ziggler superkicked him last week. Ambrose said he would burst Owens’ head like a tomato and would throw everything at Owens and Ziggler to would retain his title. He also called Owens a crybaby. The crowd buzzed when Braun Strowman and Kane faced off, but they quieted down as soon as they started wrestling. Strowman got the better of him but Kane eventually made a tag to Ryback. Harper caught him with a Michinoku driver and they got the heat again. Ryback made a hot tag to D-von who ran wild on Bray Wyatt. D-Von hit a diving headbutt but Strowman broke up the cover, so Kane knocked him out of the ring. Strowman posted Kane though, and Rowan knocked Ryback over the barricade into the crowd. Harper superkicked D-Von on the outside and Bray hit Bubba with Sister Abigail for the win. The faces made brief comebacks but this was a pretty one-sided win. Backstage, Santino saw that his tree was knocked over and Stardust entered with the Ascension to mock him. Neville jumped in wearing an elf hat, with elf ears. Ascension threatened the little elf, so Titus O’Neil joined the party to even the odds. Stardust said Christmas was cancelled but they could save it if they beat the Ascension. The crowd is dead, and the Usos each hitting dives to the outside didn’t wake them up. Del Rio won after hitting the double foot stomp on Jey Uso. The setup for this was worse than usual. Not much of a match. Afterwards, the League of Nations continued the attack but Roman Reigns ran out to make the save. Reigns tossed Sheamus over the announce table and hit Del Rio with a superman punch. An Uso superkicked Rusev, and Reigns followed with a superman punch. Reigns and the Usos stood tall as the League yelled at them from the ramp. Dean Ambrose, Santino, Becky Lynch, and New Day wished everyone happy holidays. Santino did the introductions for his team and they came out to Christmas music. Santino called O’Neil as his favourite Irishman and Neville “the man gravity seems to consistency overlook.” The Ascension and Stardust backed Santino into a corner but Neville made the save, knocking out all three with a corkscrew dive. Neville hit Red Arrow on Viktor for the win. Backstage, Dolph Ziggler told Renee that the Intercontinental Title was special to him because it’s the first title he won on his own. Ziggler said he would win the title and 2016 would be his year. That seems unlikely. They aired a clip from Tribute to the Troops. They really focused on Roman Reigns. On commentary, Becky Lynch said she was very proud of Charlotte for getting on the cover of Muscle & Fitness Hers. Michael Cole pressured her into telling us what’s more important to her - Charlotte’s friendship or the [women’s] title. She hesitated, but eventually said winning the title is her ultimate goal. Team B.A.D. came out during the match (to Sasha Banks’ music). They wore stupid Christmas outfits, including Banks as a snowman. They went straight to Lynch, poured eggnog on her head and attacked her. The story was that Charlotte saw it happening but didn’t help, applying the Figure Eight instead for the tap-out win. Cole in particular freaked out because it wasn’t even a title match, suggesting she should’ve helped. Backstage, Kevin Owens told Renee that he’s the real I.C. champion just like he’s the real Breakout Star of the Year. He said Smackdown was the Kevin Owens Show and he would walk out as champion. He left, not before telling Renee that she looks ridiculous (in her white Christmas dress/attire). After a break, Cole said Owens threw a Christmas hat at them on commentary. Jerry Lawler and Booker T made sure to clarify that Owens threw it specifically at Cole. Owens tossed Ziggler into the gifts and trees on the stage, and attacked Ambrose with gift boxes. Ambrose and Ziggler fought back and launched Owens off the stage on to some more Christmas stuff. Ambrose and Ziggler fought down to the ring and the crowd chanted for Ambrose. Owens popped back in the ring and held up Ziggler for an electric chair drop but Ziggler slipped out, superkicked Ambrose, Owens superkicked Ziggler and Ambrose clotheslined Owens. Ziggler hit an X-Factor off the top but Owens pulled him out of the ring and threw him into the steel steps. Ziggler applied a sleeper on Owens, so Owens did his running senton onto Ambrose with Ziggler still on his back. Owens posted Ziggler and hit a nasty suplex on Ambrose. Ambrose landed right on his head and they replayed it repeatedly. As the referee checked on Ambrose, Owens went outside and sent Ziggler into the barricade with a fallaway slam. Ambrose recovered somehow and hooked Owens in for Dirty Deeds, but Ziggler jumped them from behind to hit a Zig Zag as Ambrose hit Owens with Dirty Deeds all at once. Cool spot. Ziggler superkicked Owens out of the ring and Ambrose hit Ziggler with Dirty Deeds for the win. Fun match and the crowd popped big for Ambrose. Ambrose swung the title around and posed on the steel steps as the show ended. Cole said Owens was destroying a tree as this happened. 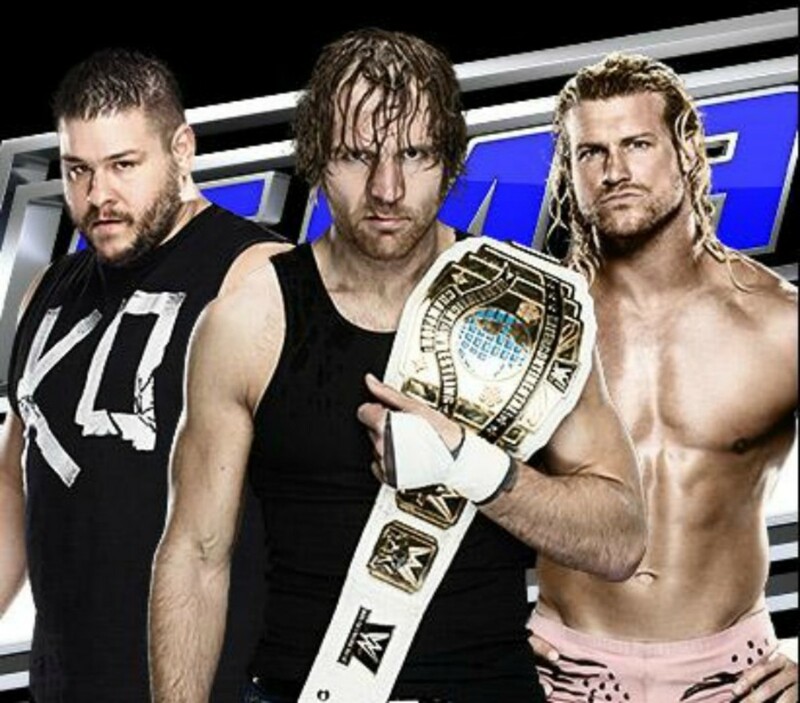 This was a very normal Smackdown show, despite being live and having two title matches. The main event was worth watching. Hopefully Dean Ambrose is fine.